It was only a matter of time before Mercedes got in on the burgeoning mini SUV market – and that time is in 2015, when the GLA you see here will join the rapidly expanding A-class family to bring fresh competition to the BMW X1/X2 and Audi Q3/Q4 set. According to CAR's sources, the first drawings of the GLA showed a clean baby crossover vehicle which has very little in common with the much bigger, boxier Mercedes GLK or ML. The front end features an upright grille with two horizontal bars, a new trademark element to be found on all future MB SUVs and crossovers. It’ll contrast with the saloons’ single crossbar, while the sports cars will accent the three-pointed star. 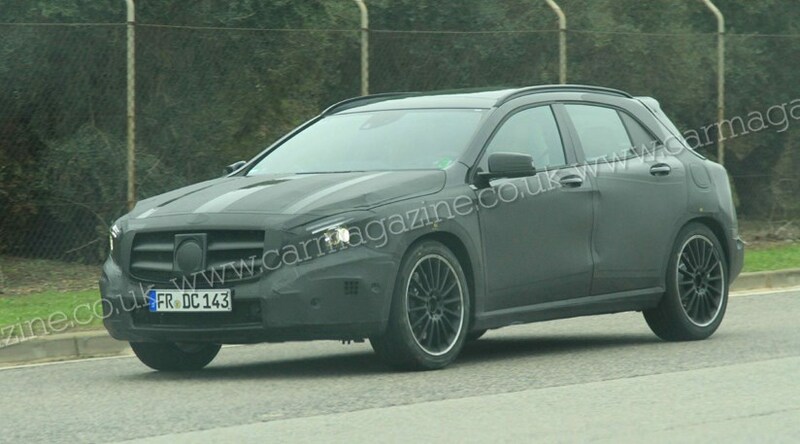 From the appearance of the car in these spy shots, we can see the GLA will stick closely to the original sketch design cues, but also share elements with the A-class around the nose. Unlike lesser A-class variants, the GLA won’t be available with the base 1.2-litre petrol engine or with the entry-level 90bhp diesel co-developed with Renault. Instead, customers can choose from three petrols (a 1.6, 2.0 or a 2.2) and a pair of diesels (a 1.6 or 2.2) in a variety of power outputs. The GLA sits on a 2700mm wheelbase and its other vital statistics (length 4440mm, width 1800mm, height 1500mm) suggest that this Mercedes is quite a bit lower and sportier than its rivals. This being Mercedes, the power brokers of Affalterbach are preparing an AMG model. Badged GLA45 AMG, it’ll sport a twin-turbo 2.0-litre four-pot rated at 350bhp and 332lb ft. Since Audi and BMW are preparing coupe versions of their entry-level crossovers, Mercedes, too, is allegedly contemplating adding an even sportier two-door GLA derivative. No, we don’t want to even think about the nomenclature chaos such a newcomer might cause. And the GLA will be available with all-wheel drive? The MFA architecture which will power all future small Mercs offers a mix of front- and Mercedes' new all-wheel drive system, the latter using a 4Matic Haldex clutch. Developed espeically for transverse-mounted engines, the system integrates the power take-off unit (which sends power to the rear wheels) into the standard 7G Tronic automatic transmission housing. That makes for fewer drivetrain losses and more compact packaging. Mercedes claims the 4Matic gubbins are 25% lighter than a regular all-wheel drive system. Meanwhile, the electrohydraulic clutch allows the car to shuffle torque distribution between the axles, and individually to each wheel. Next year's CLA 45 AMG 'mini-CLS' will be the first Mercedes to use the system, in order to deploy the power from its 2.0-litre turbocharged engine.